I often get calls asking what class of rubber insulating gloves is required for specific levels of voltage. The following is information from OSHA. Employees who work in close proximity to live electrical current may require a variety of electrical insulating protective equipment. The Occupational Safety and Health Administration (OSHA) outlines this in their electrical protective equipment standard (29 CFR 1910.137) which provides the design requirements and in-service care and use requirements for electrical-insulating gloves and sleeves as well as insulating blankets, matting, covers and line hoses. Other requirements include daily inspections for any damage before each day’s use and retested and certified every six months. You can print a copy of the Electrical Glove classification, voltage levels, and labeling chart by clicking on this “CHART” link. Gloves used for hybrid vehicle and car repairs, service, and manufacturing. Hybrid vehicles use high voltage batteries and electric motors for power. The batteries generate quite a shock. Most consumers and technicians are not cognizant of the amount of power. The voltage can range from 144 volts on a Honda Civic to 500 volts on a Toyota Prius so the battery can pack quite a wallop. Therefore, there is more than enough juice to fry anyone who accidentally comes into contact with the high voltage battery, wiring or power equipment components used in hybrid vehicles. 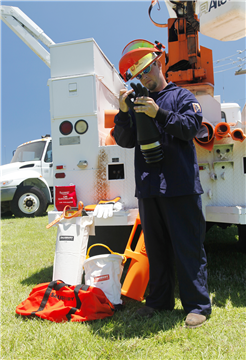 The recommended protection for technicians who service these vehicles is to wear Class 0 rated rubber insulated gloves, which are rated up to 1,000 volts AC. These gloves should be free of any tears, pinholes, or cuts and certified since they have a shelf-life. See this link for Hybrid Vehicle Gloves. Also, you must make sure the vehicle is turned OFF before you begin any electrical or mechanical repairs on any hybrid power components. Gloves-Online is pleased to announce that we now represent the complete line of Salisbury/Honeywell Linemen’s Insulating gloves for electrical workers. This is our newest line of Gloves for electrical workers. Salisbury rubber insulating gloves have earned the reputation for superior performance – meeting and exceeding the requirements of the current ASTM D120 specifications and the IEC EN 60903 Standards. The Salisbury line includes all Classes in sizes from 7 to 12. The classes of the gloves include 00, 0, 1, 2, 3 and 4 from 500 volts AC (low voltage) to the 36,000 volts AC (high voltage). These linemen’s gloves also include the Class 0 range (up to 1,000 AC/1,500 DC) used for the repair and manufacturing of hybrid electric vehicles and automobiles. We are proud to offer these gloves since they are manufactured in the USA not far from our warehouse which provides you with freshly manufactured gloves without the annoyance and worry of purchasing imported linemen’s gloves with limited certification/aging dates.